When I think of dumplings, I usually think of the Chinese variety that you would normally find in dum sum, but there's another type of dumpling. This version of dumplings can be found in the chicken and dumplings dish, a classic one pot meal. Now I've never had chicken and dumplings in my life, but when America's Test Kitchen had an episode (season 11, episode 9: Dutch Oven Classics) where they featured this Southern dish, I could not resist. You can probably find a pretty good chicken and dumplings recipe from either Food Network's Paula Deen or the Neelys who are known for their Southern cooking, but America's Test Kitchen does a decent job with this dish. I just had to try it because it looked so good (view the corresponding video later in this post). What I liked about this recipe is how tender the chicken got after it was simmering for about an hour. This is a definite one pot dish. The vegetables (carrots, onions, celery) really went well with the chicken and broth, but one thing that I wasn't into was the dumplings itself. I want to make it clear that this is in no way a criticism of the recipe itself. I think my chicken and dumplings turned out the way it was supposed to turn out and it was indeed quite good. Having never had chicken and dumplings before, this was definitely a success, but I think I'm just not a dumplings kind of a guy...it's just a personal preference of mine that I've discovered after trying chicken and dumplings for the first time. I think if I went to an authentic Southern restaurant and had their chicken and dumplings, I'd still say the same. The dumplings to me didn't have a whole lot of flavor and texturally it just seemed rather doughy. 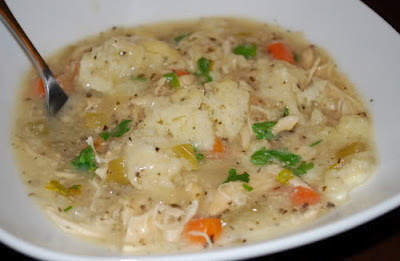 Again, for those of you who love chicken and dumplings, this recipe is great and deserves a spot in the rotation during the week because it's delicious and was easy to make. To me the dumplings part of the dish is just not my cup of tea. What I would do next time is to cook this dish without the dumplings. Of course it would no longer be a chicken and dumplings dish, but more of a chicken soup which is fine by me. Chicken soup is great in the winters to warm you up or when you're feeling sick. Cooking is about tasting, adjusting, tasting some more, etc., so I have no problem excluding the dumplings. I would still add a little bit of flour because I did like how the dumplings thickened the broth. If you're looking for a good chicken stock, I highly recommend the Better Than Bouillon paste that you mix with water to get your stock. You can drink it by itself and it'd still tastes quite good. I've tasted other chicken stocks (ie. Swanson) and they taste artificial as if it contains a lot of chemicals. When I think of chicken stock, I think of the broth you get from chicken soup. Some store-bought chicken stocks simply lack this flavor and taste no where near it and that's why I recommend Better Than Bouillon since it gives you that nice savory chicken soup flavor you would expect to get from a chicken stock. Another idea is to use this recipe and make turkey and dumplings using leftover turkey from your Thanksgiving dinner (see recipe for making a Thanksgiving turkey). I would exclude the dumplings and convert this dish from chicken and dumplings to just chicken soup. Use Better Than Bouillon for your chicken stock. You'll be glad you did. Try pairing this dish with some other Southern side dishes like cornbread, baked beans, or collared greens. 1. FOR THE STEW Pat chicken thighs dry with paper towels and season with 1 teaspoon salt and ¼ teaspoon pepper. Heat oil in large Dutch oven over medium-high heat until shimmering. Add chicken thighs, skin-side down, and cook until skin is crisp and well browned, 5 to 7 minutes. Using tongs, turn chicken pieces and brown on second side, 5 to 7 minutes longer; transfer to large plate. Discard all but 1 teaspoon fat from pot. 2. Add carrots, onions, and celery to now-empty pot; cook, stirring occasionally, until caramelized, 7 to 9 minutes. Stir in sherry, scraping up any browned bits. Stir in broth and thyme. Return chicken thighs, with any accumulated juices, to pot and add chicken wings. Bring to simmer, cover, and cook until thigh meat offers no resistance when poked with tip of paring knife but still clings to bones, 45 to 55 minutes. 3. Remove pot from heat and transfer chicken to cutting board. Allow broth to settle 5 minutes, then skim fat from surface using wide spoon or ladle. When cool enough to handle, remove and discard skin from chicken. Using fingers or fork, pull meat from chicken thighs (and wings, if desired) and cut into 1-inch pieces. Return meat to pot. 4. FOR THE DUMPLINGS Whisk flour, baking soda, salt, and sugar in large bowl. Combine buttermilk and melted butter in medium bowl, stirring until butter forms small clumps; whisk in egg white. Add buttermilk mixture to dry ingredients and stir with rubber spatula until just incorporated and batter pulls away from sides of bowl. 5. Return stew to simmer; stir in parsley and season with salt and pepper to taste. Using greased tablespoon measure (or #60 portion scoop), scoop level amount of batter and drop over top of stew, spacing about ¼ inch apart (you should have about 24 dumplings). Wrap lid of Dutch oven with clean kitchen towel (keeping towel away from heat source) and cover pot. Simmer gently until dumplings have doubled in size and toothpick inserted into center comes out clean, 13 to 16 minutes. Serve immediately. thanks guys...trying for the first time tonight! Hello @Anonymous, I hope your chicken and dumplings using America's Test Kitchen's recipe turns out well. Good luck! Don't leave out the sherry its what makes the dish the best you have ever had. You can not taste it it blends in. But if its missing the dish is blander. Hi @Anonymous, ya I later tried the America's Test Kitchen recipe for Chicken and Dumplings with the sherry. The sherry does indeed add a little more flavor, and it's not even a whole lot of sherry...just a quarter of a cup.